Come and enjoy this brand-new apartment home located inside the Sanctuary Court community. 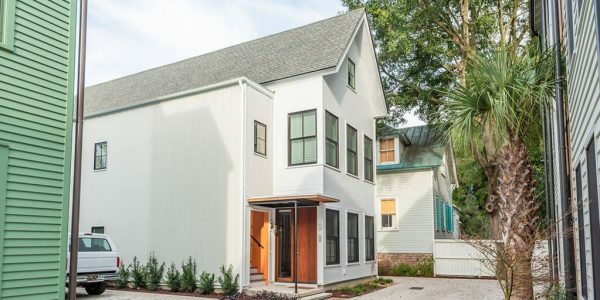 This home provides luxurious living accommodations in the historic district of downtown Charleston. This unique apartment is a 2-story suite with a loft overlooking the large living area. This loft space serves as a third bedroom, den or in-home office. The 1st floor consists of two large bedrooms with en-suite bathrooms, large walk-in closets, a guest powder room, and a large living/kitchen area. The living space benefits from 18’ vaulted ceilings and a large hanging light fixture to accentuate the grand feel of this home. A spiral staircase leads to the second-floor loft, which can be used for an office, den or a third bedroom with en-suite bathroom. The provided appliances are brand-new stainless-steel Whirlpool appliances, including a gas range, hood and microwave, refrigerator with ice/water dispenser, garbage disposal, dishwasher and a washer/dryer. Loft over living room with vaulted 18’ ceilings.